Targeting histone deacetylase activity in rheumatoid arthritis and asthma as prototypes of inflammatory disease: should we keep our HATs on? Cellular activation, proliferation and survival in chronic inflammatory diseases is regulated not only by engagement of signal trans-duction pathways that modulate transcription factors required for these processes, but also by epigenetic regulation of transcription factor access to gene promoter regions. Histone acetyl trans-ferases coordinate the recruitment and activation of transcription factors with conformational changes in histones that allow gene promoter exposure. Histone deacetylases (HDACs) counteract histone acetyl transferase activity through the targeting of both histones as well as nonhistone signal transduction proteins important in inflammation. Numerous studies have indicated that depressed HDAC activity in patients with inflammatory airway diseases may contribute to local proinflammatory cytokine production and diminish patient responses to corticosteroid treatment. Recent observations that HDAC activity is depressed in rheumatoid arthritis patient synovial tissue have predicted that strategies restoring HDAC function may be therapeutic in this disease as well. Pharmacological inhibitors of HDAC activity, however, have demonstrated potent therapeutic effects in animal models of arthritis and other chronic inflammatory diseases. In the present review we assess and reconcile these outwardly paradoxical study results to provide a working model for how alterations in HDAC activity may contribute to pathology in rheumatoid arthritis, and highlight key questions to be answered in the preclinical evaluation of compounds modulating these enzymes. Persistent recruitment, activation, retention and survival of infiltrating immune cells in the synovium of patients with rheumatoid arthritis (RA) and other forms of inflammatory arthritis, stromal cell hyperplasia and eventual joint destruction, are fueled and maintained by a complex network of chemokines, cytokines, growth factors and cell–cell interactions. Explosive increases in our understanding of how distinct components of this network, such as TNFα, IL-1, IL-6 and receptor activator of NFκB ligand, contribute to inflammation and joint destruction in RA have been translated into innovative and increasingly successful treatment of patients in the clinic . Many of the extracellular stimuli driving pathology in RA do so through the activation of conserved intracellular signaling proteins and pathways, including NFκB, the mitogen-activated protein kinases, phospha-tidylinositol 3 kinases (PI3Ks) and the Janus tyrosine kinase (JAK)/signal transducers and activators of transcription (STAT) pathway. These in turn represent additional targets for therapeutic intervention to which intensive academic, pharmaceutical and clinical effort is being applied . The relative utilization, contribution and requirement of specific inflammatory mediators, and their intracellular signaling pathways, in the pathology of RA, however, is quite heterogeneous between patients – possibly explained by predisposing genetic factors and environmental influences . Inflammatory gene responses are further subjected to epi-genetic regulation, most simply defined as inherited or somatic modification of DNA that, rather than altering gene product function, changes gene expression without altering the sequence of bases in the DNA. Epigenetic modifications important to gene regulation include methylation of DNA and post-translational modification of histone proteins, which regulate the chromatin architecture and gene promoter access. Methylation of DNA, particularly of CpG dinucleo-tides clustered in islands surrounding gene promoter regions, can effectively silence gene expression by blocking transcription factor binding to DNA, or activating transcriptional co-repressors . Changes in the methylation status of genes regulating cell proliferation, inflammatory responses and tissue remodeling have been reported in RA, systemic sclerosis and systemic lupus erythematosus, suggesting epigenetic contributions to pathology in these diseases [5, 6]. Post-translational modifications to histone proteins, including acetylation, methylation, phosphorylation, sumoylation and ubiquitina-tion, regulate transcription factor access to gene-encoding regions of DNA and facilitate gene transcript elongation . Recent evidence has suggested that decreased histone deacetylase (HDAC) activity in RA patient synovial tissue may relax the chromatin structure and promote pathology by enhancing transcription of inflammatory gene products . Current discussion has focused primarily on possible epigenetic contributions of altered HDAC activity to the pathology of RA and other immune-mediated inflammatory diseases [5, 6, 9]. Little attention has been given, however, to the potential role of HDACs in nonepigenetic processes, such as the dynamic regulation of intracellular signaling pathways in RA. In the present review, we shall briefly introduce how reversible acetylation of histone and non-histone proteins regulates gene expression, and how HDAC inhibitors (HDACi) influence this process, and we highlight key intracellular signal transduction pathways important to RA that are regulated by reversible acetylation. We will then critically review and reconcile paradoxical findings that, while depressed HDAC activity is thought to contribute to human immune-mediated inflammatory diseases, pharmacological inhibitors of HDAC activity display potent therapeutic effects in animal models of arthritis. In doing so, we provide a framework for assessing the role of HDACs in RA, and the therapeutic potential of modifying HDAC activity in the clinic. Regulation of gene expression is directly associated with changes in the conformation of chromatin . These changes occur as a result of acetylation and deacetylation of core histones, the major protein components of the chromatin structure [10, 11]. Two copies of each of four histone proteins (H2A, H2B, H3 and H4) form a complex around which 146 base pairs of the DNA strand are wound. The N-terminal tail of each histone contains several lysine residues, substrates for enzymatic modification by the addition of an acetyl group. Histone acetylation not only reduces the net positive charge of the protein, promoting DNA unwinding and relaxation of the chromatin structure, but also creates binding sites on the histone for transcriptional cofactors and other cellular proteins containing bromodomains . Deacetylation of histone lysine residues reverses this process, allowing condensation of the nucleosome and preventing transcription factor and RNA polymerase II access to gene promoters [7, 10]. Reversible acetylation and deacetylation of histones is an important process in the regulation of inflammatory gene responses [11, 13]. 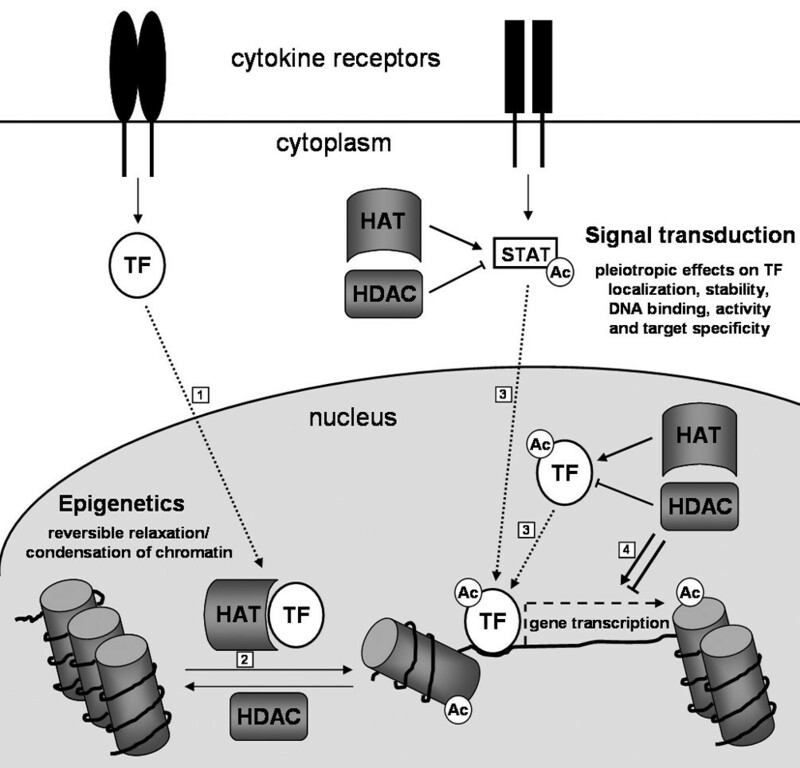 The acetylation status of histones is regulated by two different classes of enzymes: histone acetyl transferases (HATs) and HDACs. TNFα, lipopolysaccharide and other inflammatory stimuli induce association of multiple transcription factors, including the NFκB p65/RelA subunit, activator protein 1, p53 and forkhead box class O (FoxO) proteins, with transcriptional coactivators containing intrinsic HAT activity (Figure 1) . Epigenetic and signal transduction contributions of histone deacetylase activity to gene transcription and cell biology. (1) Ligation of cytokine or other inflammatory receptors leads to phosphorylation and/or dimerization of transcription factors (TF), followed by their nuclear translocation and association with histone acetyl transferases (HATs). (2) Subsequent activation of HATs contributes to epigenetic regulation of gene expression through acetylation (Ac) of histones (barrels), relaxing chromatin structure, and (3) exposing gene promoter regions to the TF. Histone deacetylases (HDACs) reverse this epigenetic process, leading to chromatin condensation and repression of gene expression. HATs and HDACs also finely tune gene expression and cellular processes through pleiotropic, nonepigenetic signaling pathways. Sequential acetylation and deacetylation of specific lysine residues on TF – such as signal transducers and activators of transcription (STAT), NFκB p65 and forkhead box class O proteins – in the nucleus or cytoplasm, influence TF protein stability, nuclear localization, DNA binding capacity, activation and gene target specificity. (4) Depending on the transcription factor and gene target, this can either enhance or inhibit gene transcription. Transcription factor association with HATs, such as p300, cAMP-response element-binding protein-binding protein (CBP) or P/CAF, accomplishes three tasks important in the regulation of gene induction (Figure 1) . First, transcription factor association with HATs targets HAT enzymatic activity to gene promoter regions. Second, the recruited HAT activity induces histone acetylation and exposure of gene promoter regions. Third, HATs acetylate the associated transcription factor – this can modify the protein half-life of the transcription factor, regulate its nuclear retention and modulate its transcriptional activity . In the simplest of models, the enzymatic activity of HDACs opposes that of HATs, repressing gene transcription through deacetylation of histones, and repressing activation of transcription factors via deacetylation or recruitment of transcriptional co-repressors, such as glucocorticoid receptors [11, 15]. For many transcription factors, however, including NFκB p65 and FoxO proteins, sequential acetylation and deacetylation of lysines on transcription factors is also required for stabilizing expression, or activating or determining the target gene specificity of the transcription factor (Figure 1) . HATs and HDACs therefore do not function simply as on/off switches for gene transcription. Instead, a coordinated balance in their activity is required for the functional output of transcription factors. The human genome encodes 18 different HDACs, which are grouped into four distinct classes based on structural homology with HDACs found in yeast [11, 16]. Class I HDACs (HDAC1 to HDAC3 and HDAC8) are nuclear proteins broadly expressed throughout mammalian tissues and most closely resemble yeast RPD3. Class II HDACs (HDAC4 to HDAC7, HDAC9 and HDAC10), most similar to yeast HDA1, display a more restricted tissue expression and can shuttle between the nucleus and cytoplasm, exerting their effects on targets in both cellular compartments. HDAC11 is designated as the sole class IV HDAC, due to low sequence similarity with other HDACs . Class III silent information regulator 2 (sirtuin) HDACs (Sirt1 to Sirt7) are nicotinamide adenosine dinucleotide-dependent enzymes, structurally unrelated to class I, class II and class IV HDACs. Of the sirtuins, only Sirt1 displays strong deacetylase activity, while the others have unknown functions or act as mono-ADP-ribosyl transferases. Sirt1, like other HDACs, targets both histone and nonhistone proteins [17, 18]. HDACi, both synthetic and naturally derived, can be grouped loosely into four categories based on their chemical structures [16, 19]. Well-characterized hydroxamic acid derivatives include Trichostatin A (TSA), suberoyl anilide bishydroxamide (SAHA, vorinostat), and ITF2357. Butyrates and valproic acid are short-chain fatty acids, HC-toxin and FK228 (depsipeptide, also known as FR901228 in earlier studies) are cyclic tetrapeptides/epoxides, and MS-275 is a benzamide derivative. In vitro these compounds inhibit HDAC activity at concentrations ranging from nanomolar (TSA, ITF2357, HC-toxin) to millimolar (butyrates, valproic acid). The hydroxamates are nonspecific in the sense that they do not discriminate between distinct class I, class II and class IV HDACs. In contrast, valproic acid and MS-275 selectively target class I HDACs at lower concentrations, while also inhibiting class II HDACs at higher concentrations [16, 19, 20]. Knowledge of the crystal structure of HDACi bound to HDACs, as well as the development of strategies allowing high-throughput analysis of chemical libraries, is leading to the generation of new HDACi and the potential identification of HDAC isoform-specific inhibitors. One novel compound identified by this strategy is tubacin, a specific inhibitor of HDAC6 . Sirtuins, as well as other nicotinamide adenosine dinucleotide-dependent enzymes, are inhibited by nicotinamide. A growing list of sirtuin inhibitors, including sirtinol, is being identified through biochemical screens , but their influence on cellular biology or gene responses relevant to inflammatory disease is just beginning to be assessed . Many of the compounds listed above are in phase I, phase II and phase III clinical trials for the treatment of leukemias and solid tumors [16, 19, 20, 24]. In general, cancer cells are more sensitive to HDACi than their nontransformed cellular counterparts, these compounds have been well tolerated by patients, and therapeutic effects have been documented. Most HDACi have been shown to induce cell cycle arrest, differentiation and/or apoptosis in a wide range of transformed cells in vitro, in animal tumor models and in clinical cancer trials . The ability of HDACi to induce tumor growth arrest is predominantly associated with their ability to induce expression of cyclin-dependent kinase inhibitor p21 Waf1 . Apoptosis induction may be secondary to cell cycle arrest, or may be a result of cell-specific regulation of proapoptotic genes (Bak, Bax, Bim, Noxa, Puma and TRAIL) and of antiapoptotic genes (IAPs, Mcl-1, Bcl-2, Bcl-XL, and FLIP) [25, 26]. Several lines of experimental evidence make it increasingly clear that the effects of HDACi on cellular activation, proliferation and survival cannot be attributed solely to the regulation of chromatin structure. First, in cancer trials it has been difficult to establish a clear association between HDACi pharmacokinetics and histone acetylation [27, 28]. Second, gene array profiles obtained from cell lines exposed to different HDACi report that only 2% to 10% of expressed genes are regulated by HDACi, a comparable number of which are upregulated and are downregulated [26, 29, 30]. These findings are generally incompatible with global chromatin opening being the primary effect of HDACi exposure. Third, careful analysis of cellular dose-responsiveness to HDACi has demonstrated regulation of cytokine production in the absence of changes in histone acetylation status . Fourth, phylogenetic studies in bacteria indicate that HDACs evolved prior to histones, suggesting an initial role for HDACs in the regulation of nonhistone substrates . Fifth, a number of gene product targets used as biomarkers for HDACi activity in vivo, such as p21 Waf1 , are also regulated by transcription factors that are direct substrates of HDACs. The acetylation status of these transcription factors influences protein stability, activation and gene promoter specificity. Some 200 nonhistone proteins have been identified as HDAC substrates, at least in vitro [14, 19], and a subset of these substrates has already been identified as playing an important role in disease perpetuation and progression in RA . Studies addressing the acetylation status of signaling proteins, and consequences of changes in protein acetylation for cellular activation and survival in RA synovial tissue, may define how depressed HDAC activity contributes to pathology in RA, and may suggest molecular mechanisms responsible for the therapeutic effects of HDACi in animal models of arthritis. Components of the NFκB transcription factor are highly expressed and activated in RA synovial tissue, making significant contributions to inflammatory gene expression and cellular survival in the synovium . The NFκB p65/RelA subunit is acetylated on at least five distinct lysine residues by p300/CBP. Acetylation of lysine 221 weakens p65 affinity for IκBα, allowing dissociation of p65 and subsequent nuclear import . This acetylation step also enhances p65 affinity for DNA, but a separate acetylation event at lysine 310 is required to enhance p65 transcriptional activity . Acetylation of p65 at distal lysines 122 and 123 reciprocally decreases the p65 binding affinity to DNA, enhances association with IκBα, and promotes nuclear export of the transcription factor . HDAC1, HDAC2 and HDAC3 can promote deacetylation of p65 at lysine 221, stabilizing p65-IκBα interactions , while SIRT1 can inactivate p65 through deacetylation of lysine 310 . The human FoxO family of transcription factors consists of four members: FoxO1, FoxO3a, FoxO4 and FoxO6. The PI3K-responsive FoxO1, FoxO3a and FoxO4 proteins modulate the expression of genes regulating cell cycling (for example, p27 Kip1 and p21 Waf1 ), genes regulating stress responses (for example, catalase and manganese superoxide dismutase) and genes regulating apoptosis (for example, FasL, Bim, and TRAIL) . FoxO proteins integrate growth factor and stress stimuli either to promote cell proliferation, growth arrest and survival or to induce apoptosis . Activation of the PI3K/protein kinase B (PKB) pathway by growth factors and inflammatory cytokines results in FoxO phosphorylation, subsequent nuclear exclusion and a block in transcription of FoxO-regulated genes. PI3K/PKB signaling is highly activated in RA synovial tissue, and significantly elevated levels of PKB-inactivated FoxO4 are present in RA synovial tissue macrophages compared with disease controls [39, 40]. Curiously, within RA patient populations, PKB-dependent inactivation of FoxO1, FoxO3a and FoxO4 correlates inversely with patient parameters of inflammatory disease activity (erythrocyte sedimentation rate and serum C-reactive protein concentrations) . This might be explained by findings that oxidative stress and proinflammatory cytokines counteract PI3K/PKB signaling to drive nuclear localization, transcriptional activation and gene target specificity of FoxO proteins . JNK-dependent phosphorylation of FoxO proteins, possibly in conjunction with Mst-1-dependent phosphorylation, promotes FoxO nuclear import . In the nucleus, FoxO proteins can undergo serial acetylation and deacetylation. Although details are still emerging, it appears that acetylation of FoxO proteins by p300/CBP can induce transcription of proapoptotic gene products or, in the presence of sufficient PI3K/PKB signal, facilitate FoxO nuclear export . Sequential deacetylation events mediated by class I/II HDACs and Sirt1, however, target FoxO to transcribe genes needed for cell cycle arrest and survival responses to environmental stress . The ability of FoxO transcription factors to integrate multiple signals to determine cell fate choices (proliferation, survival or apoptosis) influencing inflammatory disease in vivo is strikingly recapitulated in FoxO3a-deficient mice. Mice lacking FoxO3a develop spontaneous systemic autoimmune disease marked by proliferation and activation of autoimmune T cells . When these mice are crossed onto a Rag2-/- background (lacking lymphocytes), however, the resulting progeny are resistant to K/BxN serum-induced arthritis, probably due to Fas-induced apoptosis of activated neutro-phils . Together, these studies provide circumstantial evidence that FoxO proteins interpret contextual signals to regulate inflammatory responses in vivo. The tumor suppressor protein p53 regulates cellular responses to stress signals causing DNA damage. Stabilization and transcriptional activation of p53 induces cell cycle arrest at the G1/S interface, allowing for effective repair of fragmented DNA. When the extent of DNA damage is broad, cells undergo p53-induced apoptosis . In RA, high levels of fragmented DNA are detected in synovial tissue, and increased protein expression of p53 is often observed, primarily in late stages of the disease . The enhanced protein expression of p53 might be explained by reactive oxygen species-induced somatic mutations in p53 . Some of these mutations lead to the expression and accumulation of inactive p53, which could in turn contribute to inadequate apoptotic responses of stromal cells in the inflamed joint . The p53 protein half-life and activation, however, is tightly regulated by multiple reversible phos-phorylation, methylation, ubiquination and acetylation events, which could also contribute to altered p53 protein expression and function in RA synovial tissue . Acetylation of p53 by p300/CBP or P/CAF can increase p53 protein stability in vitro, by blocking Mdm2-mediated ubiquitination and proteasomal degradation of p53. Acetylation of p53 is reversed by Sirt1, inhibiting p53 transcriptional activity and facilitating its degradation . Association of p53 with HATs can also result in transactivation of p53, although additional mutational and genetic studies have cast doubt on how and whether acetylation regulates p53 stability or activity in vivo . Given the potent effects of p53 on fibroblast-like synoviocyte (FLS) proliferation and survival in vitro, it will be of interest to determine whether acetylation also regulates the function of p53 in RA synovial tissue. Activation of JAK kinases and subsequent stimulation of transcriptional activity of the STAT family of transcription factors is one of the main signaling pathways triggered by cytokines. JAK/STAT signaling regulates expression of genes involved in cellular activation, differentiation and survival . In analyses of RA synovial tissue, increased expression and activation of STAT1 is observed in RA patients compared with disease control individuals . Additionally, activation of STAT3 contributes to the survival of RA synovial macrophages. Inhibition of STAT3 induces apoptosis in macrophages isolated from the joints of RA patients via downregulation of the antiapoptotic protein Mcl-1 . The regulation of gene expression by STATs requires HDAC activity – TSA, SAHA and butyrate can block activation of JAK1 and subsequent STAT1 phosphorylation in IFNγ-stimulated carcinoma cells, and STAT1-dependent transcription can be enhanced by overexpression of HDAC1, HDAC2 or HDAC3 . Also, the protective effects of SAHA in a murine model of graft versus host disease are associated with a block in the rapid accumulation of phosphorylated STAT1 in the liver and the spleen . While it appears that acetylation may regulate STAT1 signaling indirectly, substantial evidence indicates that STAT3 is a direct target of HATs and HDACs. STAT3 dimerization, DNA binding and transcriptional activation following cytokine stimulation requires p300/CBP-induced acetylation, and can be negatively regulated by overexpression of HDACs – primarily HDAC3 [53, 54]. It is thus clear that reversible acetylation and deacetylation play a central role in the function of intracellular signaling proteins that regulate cellular activation and cytokine production, proliferation and survival – key cellular themes in the maintenance of chronic inflammation. As many of the signaling proteins discussed above are known (or highly suspected) to contribute to pathology in RA, it will be of interest to determine the acetylation status of these proteins in RA synovial tissue, and how modulation of HDAC activity regulates signaling capacity. Given the pleiotropic effects that acetylation can confer upon transcription factor function, as evident with NFκB p65 and FoxO proteins, it will be critical to distinguish between effects on DNA binding capacity, transcriptional activity and gene target specificity. The most detailed analyses of how alterations in HAT and HDAC activity, and consequent epigenetic or signaling effects, might contribute to chronic immune-mediated inflammatory diseases are found in studies of human airway diseases, such as asthma and chronic obstructive pulmonary disease (COPD). In both bronchial biopsies and alveolar macrophages isolated from asthma patients, a significant increase in HAT activity is detected [55, 56]. A selective decrease in HDAC1 expression is also observed in asthma alveolar macrophages, corresponding with a decrease in cellular HDAC activity. Decreased HDAC activity is in turn associated with enhanced alveolar macrophage production of proinflammatory granulocyte–macrophage colony-stimulating factor, TNFα and IL-8 in response to lipopolysaccharide. Similar changes in HAT and HDAC activity are not observed in peripheral blood mononuclear cells from the same patients, suggesting that alterations in reversible acetylation are restricted locally to the site of inflammation . In COPD patients, enhanced bronchial biopsy and alveolar macrophage HAT activity does not occur, but a significant reduction in total HDAC activity, and gene expression of HDAC2, HDAC5 and HDAC8 but not of other class I/II HDACs, is observed. The degree of local HDAC impairment in COPD patients correlates with histone acetylation, IL-8 production and disease severity . Evidence has also been provided that altered expression of class III HDACs may contribute to chronic inflammation in COPD. SIRT1 expression is decreased at both the mRNA and protein levels in COPD bronchial biopsies and alveolar macrophages. Oxidative stress may contribute to decreased SIRT1 protein expression in COPD, as enhanced carbonyla-tion and tyrosine nitration of SIRT1, mimicked by exposure of SIRT1 to cigarette smoke extract, is observed . A potential role for sirtuins in autoimmunity is further suggested by the observation that aged mice lacking the sirt1 gene display deposition of autoimmune IgG1 antibodies in their liver and kidneys, and show symptoms of diabetes insipidus . Initial reports indicate that alterations in the balance of HAT and HDAC activity may also contribute to perpetuation of inflammation in RA. In a small study examining synovial tissue obtained during joint replacement surgery of seven RA patients, six osteoarthritis patients and control subjects, no differences in HAT activity were observed . HDAC activity and the ratio of HDAC/HAT activity, however, were significantly depressed in RA synovial tissue compared with tissue from osteoarthritis patients and control patients. Protein expression of HDAC1 and HDAC2 in whole synovial tissue was lower in RA patients compared with osteoarthritis patients, and immunohistochemical staining revealed a marked decrease in HDAC2 protein expression in RA compared with osteoarthritis, particularly in synovial macrophages. These results led the authors to two conclusions with important ramifications for future studies. First, the data suggest an association between pathogenic inflammatory processes in the RA synovium and reductions in HDAC activity . It is still uncertain whether the noted changes in HDAC activity in RA synovial tissue are sufficient to result in enhanced acetylation of histones or nonhistone proteins, but – consistent with this possibility – we have noted in a small study of four RA patients that acetylation of cellular proteins in RA synovial tissue is most readily detected within infiltrating macrophages (Figure 2). Within RA synovial tissue, faint staining by anti-acetyl lysine antibodies is detected throughout the tissue (Figure 2a), consistent with a universal physiological role for histone and nonhistone protein acetylation in regulating gene transcription and other cellular activities. In a subset of cells, however, strong hyperacetyla-tion is observed, localized to the nucleus (Figure 2a,b). Hyperacetylation of cellular proteins in rheumatoid arthritis synovial tissue. (a) Immunohistochemical staining of rheumatoid arthritis (RA) synovial tissue with antibodies against acetyl-lysine (Ac) (upper panels) and control rabbit antibodies (lower panels): 100× (left panels) and 400× (right panels) magnifications are displayed. (b) Immunofluorescent staining of RA synovial tissue (400× magnification) with anti-Ac antibodies (green) alone (upper panel) or in combination with 4',6-diamidino-2-phenylindole dihydrochloride staining (blue) (lower panel) showing localization to cellular nuclei. (c) Representative immunofluorescent double staining of RA synovial tissue with anti-Ac antibodies (green) and antibodies against cellular markers (red) for T lymphocytes (CD3), B lymphocytes (CD22), fibroblast-like synoviocytes (CD55), or synovial macrophages (CD68 and CD163). (d) Quantification of protein hyperacetylation in specific synovial cellular subsets. Double stainings were performed on RA synovial tissue and a minimum of 100 random cells positive for each CD marker assessed for hyperacetylation of nuclear proteins. Values represent the mean percentage and standard error of the mean of cells positive for each marker displaying protein hyperacetylation from four RA patients. Samples were obtained from patients fulfilling the American College of Rheumatology criteria for RA . Detailed descriptions of materials and methods used in these experiments have either been described elsewhere  or are available in Additional file 1. Doublestaining experiments performed on a small set of RA patients suggest that this occurs most frequently in synovial macrophages (CD68+, 48 ± 10%; CD163+, 39 ± 9%), the same cell population within RA synovial tissue in which depressed HDAC2 expression has been reported . We also frequently observe protein hyperacetylation in RA stromal FLS (35 ± 7%), but rarely in synovial B lymphocytes (22 ± 3%) and T lymphocytes (12 ± 2%). A pressing question that remains to be determined experimentally is whether these differences in HDAC activity and protein acetylation can promote inflammatory gene transcription in RA. A second important prediction put forth by Huber and colleagues is that the observed decrease in HDAC activity and expression in RA synovial tissue might preclude the therapeutic application of HDACi in RA . Important to this is their observation that total HDAC activity is decreased by approximately 75% in RA compared with normal synovial tissue. One caveat to this interpretation of the data is that the HDAC activity measured in this study was not normalized for tissue cellularity or cell-type composition of the tissue. A second caveat is that the tissue assessed was obtained from patients at the time of joint replacement. Important differences in synovial cellular composition and cytokine profiles have been detected between arthroscopic biopsies of RA patients with active disease and specimens obtained during joint replacement , underscoring the need for follow-up studies of HDAC expression and activity in RA patients representative of those who would be participating in clinical trials. If the initial study results of Huber and colleagues can be extended to active RA, this would certainly suggest that the total availability of HDACs for inhibitory compounds would be reduced. As yet, however, it is unclear whether HDAC1 and HDAC2, reduced in RA, would be the relevant targets responsible for potential anti-inflammatory effects of HDACi, and whether the residual total HDAC activity present in RA synovial tissue might still play an essential role in cellular activation and survival. These unknown factors necessitate extensive formal studies. Glucocorticoids (GCs) are invaluable therapeutic tools in the treatment of many chronic inflammatory diseases, including asthma and RA. Recent findings in the study of inflammatory lung diseases demonstrate that HAT activity and HDAC activity significantly impact upon the clinical efficacy of GC therapy . GC receptor-binding to GC response elements in gene promoter regions can directly regulate gene transcription, while at lower concentrations, GC also induce GC receptor association with, and functional inhibition of, transcription factors such as NFκB and activator protein 1. GC-induced reduction of inflammatory gene transcription in asthma patients is associated with the enhancement of HAT activity and with the recruitment of HDAC2 to activated NFκB complexes [55, 61]. In contrast to asthma patients, patients with COPD are relatively resistant to GC therapy, and this could be in part due to depressed HDAC2 expression and activity [15, 57]. Although HDAC2-deficiency does not affect nuclear import or GC response element binding of GC receptors, HDAC2-dependent deacetylation of GC receptors is required for their association with NFκB. The anti-inflammatory capacity of GC in asthma and COPD alveolar macrophages can be restored either by over-expression of HDAC2 or by theophylline-induced enhancement of HDAC activity, indicating that strategies aimed at restoring HDAC activity may enhance the efficacy of GC therapy [55, 62]. GC resistance in the treatment of RA is not as clearly defined as in COPD . More than 30% of RA patients, however, have been estimated to demonstrate a decrease in responsiveness to GC therapy within 3 to 6 months from initiation of treatment . The reasons for this are currently unknown. Suggested possibilities include decreased expression of GC receptors, or changes in expression levels of chaperone and co-chaperone proteins needed for GC receptor folding and stability. Alternative contributions might be made by increased expression of inflammatory transcription factors, expression of alternatively spliced decoy GC receptors, and upregulation of the multidrug resistance gene MDR1 . In analogy to COPD, we should consider whether depressed HDAC2 expression and activity in RA could also contribute to variation in patient responses to GC treatment. If this possibility was to be substantiated, it would have two important clinical implications. First, restoration of HDAC activity might increase patient responsiveness to GC treatment, or might allow effective utilization of lower doses of GC. Second, future clinical trials specifically targeting HAT or HDAC activity to treat RA would need to be conducted in the absence of concomitant GC treatment, as effects of HAT/HDAC modulators on GC responsiveness might introduce a significant confounding factor to analyses of the studies. In vitro, depsipeptide HDACi can induce upregulation of MDR1 and its gene product P-glycoprotein in cancer cell lines, conferring resistance to GC and chemotherapeutic drugs [65, 66]. Curiously, interactions between HDACi and the chemotherapeutic compound doxorubicin appear to be extremely sensitive to the sequence of drug administration. Pretreatment of cells with HDACi reduces subsequent doxo-rubicin-induced apoptosis, while pretreatment with doxorubicin sensitizes cells for HDACi-induced apoptosis. Given the potential importance of these drug interactions in future clinical trials, significant efforts need to be devoted to this issue in preclinical analysis of HAT and HDAC modulators. While the studies above suggest that strategies aimed at increasing HDAC activity could have therapeutic benefit in RA, other lines of experimental analysis have instead provided evidence that inhibition of HDAC activity should be pursued. Early observations that HDACi could not only induce cell cycle arrest and apoptosis in cancer cell lines, but also block inflammatory cytokine production in these cells, provided a rationale for experiments examining whether HDACi could be used therapeutically to treat immune-mediated inflammatory diseases. Compounds representing each of the chemical classes of HDACi have been used successfully in prophy-lactic and therapeutic protocols in multiple animal disease models, including those for asthma, systemic endotoxic shock, colitis, lupus, multiple sclerosis and graft versus host disease [67, 68]. A broad spectrum of HDACi has also shown potent prophylactic and therapeutic effects in animal models of arthritis. The first application of HDACi to the treatment of arthritis was reported by Chung and colleagues . Topical ointments of phenylbutyrate and TSA were applied to rat paws prior to induction of adjuvant-induced arthritis. Although neither compound prevented arthritis onset, both compounds inhibited paw swelling of treated paws, compared with untreated and contralateral paws. Synovial inflammatory infiltration, pannus formation and bone erosion were also significantly reduced. The prophylactic effects of both phenyl-butyrate and TSA were associated with local accumulation of acetylated histone proteins in the tissue, an increase in expression of the cell cycle inhibitors p16 Ink4 and p21 Waf1 , and depressed TNFα synthesis. Notably, HDACi treatment of nonarthritic rats did not induce cell cycle inhibitor expression, suggesting these compounds may preferentially affect cells in the local inflammatory environment. Another HDACi, the depsipeptide FK228, has displayed both prophylactic and therapeutic benefits in rat adjuvant-induced arthritis when administered intravenously . Prophylactic administration of the compound significantly reduced paw swelling and completely blocked the development of bone erosions. Although administration of FK228 after the onset of arthritis failed to reduce paw swelling in this model, bone erosion scores were reduced by almost 70%. FK228 was also tested in the murine autoantibody-mediated model of arthritis. A single-dose systemic administration of FK228, administered after the clinical onset of arthritis, significantly reduced joint swelling, synovial inflammation and bone erosion . The clinical benefits of FK228 were again mirrored by an increase in synovial cell histone acetylation, induction of synovial p16 Ink4 and p21 Waf1 expression, and decreased TNFα synthesis. SAHA and MS-275 have been examined in murine and rat collagen-induced models of arthritis . In mice, daily subcutaneous injection of SAHA led to moderate dose-dependent reductions in paw swelling, and production of IL-6 and IL-1β, but minimally reduced synovial infiltration and bone destruction. MS-275, in contrast, provided almost complete protection against arthritis, as assessed by the same parameters. In rats, both SAHA and MS-275 effectively reduced arthritis severity and bone erosion, although MS-275 was again more effective. When administered therapeutically in rats, MS-275 prevented both a further increase in paw inflammation, as well as the onset of bone erosions. These studies together indicate that HDACi, irrespective of their chemical classification, have the potential to alleviate inflammation and to prevent joint destruction in arthritis. Of particular interest to the clinical setting is the finding that a subset of these compounds may be therapeutically useful in established arthritis. Attempts to extrapolate to RA the therapeutic benefits of HDACi in animal models of arthritis, or the potential advantages of enhancing HDAC activity, will require a thorough analysis of the effects of HAT and HDAC modulation on primary human immune and stromal cells relevant to RA, preferably those derived from RA synovial tissue. As yet, there is only a limited number of studies published assessing a few of the cell populations considered important to the pathology of RA. Initial studies in T-cell responses indicate that HDAC inhibition can reduce the activation of pathogenic effector T cells and of memory T cells, while enhancing regulatory T-cell function. Incubation of healthy donor peripheral blood mononuclear cells with TSA reduces phytohemagglutinin and toxic shock syndrome toxin 1-induced production of T-helper type 1 cytokines, such as IFNγ, while enhancing T-helper type 2 cytokine production . TSA similarly normalizes T-helper type 1-skewed cytokine production in mitogen-stimulated T cells from systemic lupus erythematosus patients . However, SAHA, another HDACi, is ineffective in blocking anti-CD3-induced human T-cell IFNγ production, as well as in vitro and in vivo alloantigen-driven murine T-cell activation and proliferation [52, 75]. Intriguing evidence has recently emerged that HDAC activity can also modulate the generation and function of anti-inflammatory thymic-derived natural regulatory T lymphocytes . Systemic treatment of mice with TSA increases the frequency of natural regulatory T cells. Either incubated with TSA in vitro or isolated from TSA-treated mice, regulatory T cells display elevated FoxP3 expression and have enhanced suppressive function in vitro. FoxP3 is acetylated under these conditions, promoting FoxP3 association with the IL-2 promoter. HDAC9, prominently expressed in regulatory T cells, appears to be responsible for inactivating FoxP3, and regulatory T cells from HDAC9 knockout mice are increased in numbers and suppressive capacity . It is as yet unclear whether human regulatory T cells are similarly regulated by HDAC9 activity, but together these studies suggest that HDACi effects on T-cell-dependent immune responses are dependent upon the mode of T-cell activation, T-cell differentiation status or lineage commitment, and on the HDACi used. HDACi have been most extensively studied in monocytes and monocyte-derived cell lineages. SAHA inhibits release of TNFα, IL-1β, IL-12 and IFNγ by lipopolysaccharide-stimulated human monocytes . The anti-inflammatory effects of SAHA are selective, as IL-8 production remains unaffected. Moreover, while induction of TNFα, IL-12 and IFNγ production is inhibited at the transcriptional level, defects in IL-1β release are due to blocks in cytokine exocytosis . The effects of SAHA on monocyte cytokine production and release are mimicked by other class I/II HDACi (TSA and ITF2357), the class I-selective HDACi HC-toxin, and the HDAC6-specific HDACi tubacin . In all cases, HDACi blocked cytokine production at concentrations insufficient to cause monocyte apoptosis, providing evidence that anti-inflammatory effects of HDACi can be achieved in the absence of general cellular toxicity. 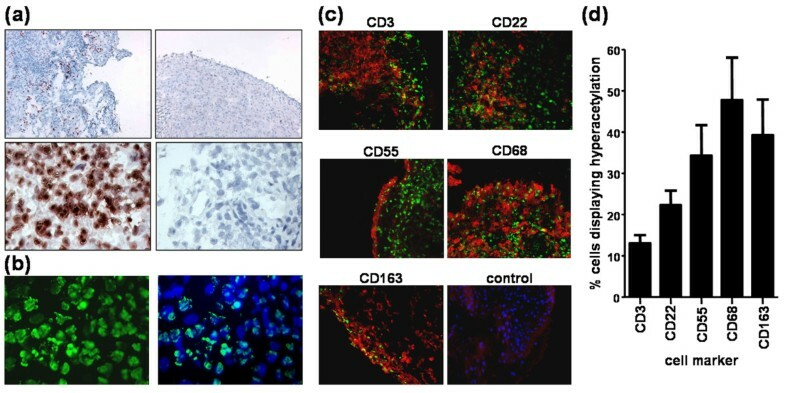 Murine bone marrow-derived monocyte differentiation into macrophages is unaffected by HDACi, but these compounds suppress differentiation into osteoclasts . In vitro, this may be a result of inhibition of receptor activator of NFκB ligand-induced NFκB transcriptional activity; and in vivo, via induction of IFNβ production by synovial cells . Studies of asthma and COPD alveolar macrophages demonstrating that decreased HDAC expression and activity are associated with enhanced lipopolysaccharide-induced granulocyte–macrophage colony-stimulating factor, TNFα and IL-8 release might predict that HDACi would also enhance macrophage inflammatory responses [55, 57]. While HDACi block restoration of alveolar macrophage GC responsiveness induced by theophylline or HDAC overexpression [62, 78], experiments directly examining the influence of HDACi on asthma and COPD alveolar macrophage activation have not been reported. In contrast, the pan-HDACi LAQ824 selectively inhibits monocyte-derived macrophage and dendritic cell production of monocyte/macrophage/dendritic cell chemokines and chemo-kine receptors, as well as the production of costimulatory molecules, cytokines and chemokines required for T-helper type 1 T-cell recruitment and activation . Stromal FLSs are the only cell population isolated from RA synovial tissue in which the effects of HDACi have been studied. Incubation of RA FLS with FK228 induces cell cycle arrest, associated with enhanced expression of the cell cycle inhibitor p16 Ink4a and acetylation of the p16 Ink4a promoter region . Treatment of FLS with either FK228 or TSA fails to induce apoptosis, but TSA can sensitize FLS to TRAIL-induced apoptosis [71, 80]. This suggests that HDACi might be particularly effective in targeting FLS proliferation or survival at the site of inflammation. Supporting this, while TSA and phenylbutyrate induce cell cycle arrest in FLS obtained from healthy rats and arthritic rats, cell cycle arrest is reversible in normal FLS following drug removal, but maintained in FLS derived from arthritic joints . It will be of interest to examine the effects of HDACi on FLS cytokine production, as these compounds have demonstrated both inflammatory and therapeutic effects on (model stromal cells or) stromal cells derived from other immune-mediated inflammatory diseases. In SV-40-transformed bronchial epithelial cell lines – often used as models in asthma and COPD studies – TSA alone, or in synergy with oxidative stress, can induce IL-8 production . In fibroblasts obtained from biopsies of patients with systemic sclerosis, TSA reduces transforming growth factor beta, IL-4 and platelet-derived growth factor-induced collagen synthesis . Angiogenesis in the synovial membrane contributes to synovitis and disease progression in RA by increasing inflammatory white blood cell access to affected joints, sustaining the nutritional requirements of invasive hyper-plastic synovial tissue and stimulating osteoclast-mediated bone resorption . A potential role for HDACs in regulating angiogenesis in chronic inflammatory diseases has not been addressed experimentally, but can be predicted based on numerous studies from tumor biology and the characterization of genetically modified mice. HDACi display inhibitory effects on angiogenesis in both in vitro and in vivo tumor models [84–90]. These effects probably result from both epigenetic influences and acetylation of hypoxia-inducible factor 1 alpha (HIF-1α) – acetylation of HIF-1α promotes ubiquitination and degradation of this critical transcriptional regulator of proangiogenic and anti-angiogenic factors [86, 87, 91]. In these tumor models, class II HDACs – rather than class I HDACs – appear to coordinate angiogenesis. In human renal carcinoma cells, inhibition of class I HDAC activity is insufficient to suppress HIF-1α, but silencing of class II HDAC4 and HDAC6 can induce HIF-1α acetylation, reducing both HIF-1α expression and activity . Cellular and molecular mechanisms underlying HDAC-dependent regulation of angiogenesis have also been investigated in primary endothelial cells. FK228 is a potent inhibitor of hypoxia-induced endothelial cell proliferation, migration and adhesion . In vascular endothelial growth factor (VEGF)-induced angiogenesis in vivo models, TSA and SAHA inhibit angiogenesis and vasculogenesis – accompanied by suppression of VEGF receptors 1 and 2, and induction of the VEGF competitor semaphorin III . Furthermore, valproic acid and TSA block endothelial cell nitric oxide signaling by suppressing expression of endothelial nitric oxide synthase [90, 92]. Genetic studies have demonstrated that HDAC3 and HDAC7 play an important role in angiogenesis and the maintenance of vascular integrity. Elevated levels of HDAC3 are detected in the walls of blood vessels during embryogenesis in mice, and HDAC3 plays an essential role in VEGF-induced embryonic stem cell differentiation into endothelial cell lineages in vitro . In mice lacking HDAC7 expression, endothelial cell–cell contacts are disrupted, leading to dilation and rupture of blood vessels, and embryonic lethality . The silencing of HDAC7 in human endothelial cells results in cellular alterations in morphology, migration and capacity to form capillary tube-like structures. HDAC7 knockdown induces strong upregulation of platelet-derived growth factor B and its receptor, which is at least partially responsible for the inhibition of endothelial cell migration . Together, these studies raise the possibility that targeting specific HDACs may be useful in preventing contributions of angiogenesis to inflammation and joint destruction in RA. Effects of HDACi on cartilage and collagen catabolism by chondrocytes may also contribute to protection of animals from joint destruction in experimental models of arthritis. Treatment of primary human chondrocytes with either TSA or phenylbutyrate inhibits gene and protein induction of matrix metalloproteinases and aggrecan-degrading enzymes (ADAMTS) induced by IL-1β and oncostatin M . TSA and butyric acid also block nitric oxide, prostaglandin E2, and proteoglycan release in TNFα-stimulated, IL-1β-stimulated and IL-17-stimulated osteoarthritis chondrocytes or cartilage explants , indicating that inflammatory disease does not generally render chondrocytes insensitive to HDACi. These initial studies together indicate that HDACi generally possess anti-inflammatory (or otherwise therapeutic) effects in vitro on many of the cell populations that contribute to synovitis and disease progression in RA. In terms of translational cell biology, it will be important to understand the effects of modulating expression and activity of specific HDACs in these cell populations. Additionally, more effort is needed in identifying appropriate biochemical and cellular biomarkers of compounds modulating HDAC activity, both in vitro and in therapeutic treatment of arthritis in animal models. Temporal and balanced regulation of HAT and HDAC activity is required for an effective but self-limiting immune response. HAT activity allows transcription factor access to gene promoter regions, and modulates transcription factor stability, DNA binding and transcriptional activity. HDAC activity can subsequently modify transcription factor activity, prevent expression of proapoptotic genes, and eventually terminate transcription following deacetylation of histones. While studies in human immune-mediated inflammatory diseases indicate that strategies aimed at decreasing HAT activity and restoring HDAC activity may benefit the treatment of RA, in vitro experimental data and animal arthritis models suggest promise for HDACi in the clinic. Are these strategies mutually exclusive? Integrating the available data into a testable model suggests not (Figure 3). If initial studies in RA synovial tissue can be extended to larger patient cohorts, and if depressed HDAC activity contributes to localized synovial inflammation, then we might predict that an enhanced ratio of HAT activity to HDAC activity may sensitize cells to inflammatory gene transcription via chromatin remodeling, may increase the DNA binding and activity of transcription factors, and may increase cellular resistance to GC treatment. Residual HDAC activity, however, would be sufficient to maintain transcription factor activity and prevent the targeting of genes that induce cell cycle arrest or apoptosis. Potential pathological and therapeutic consequences of modulating histone deacetylase activity in rheumatoid arthritis. Depressed histone deacetylase (HDAC) activity relative to histone acetyl transferase (HAT) activity in rheumatoid arthritis (RA) synovial tissue might promote chromatin relaxation and activation of inflammatory transcription factors (TF). Moreover, depressed HDAC activity may decrease patient responsiveness to glucocorticoid (GC) treatment. 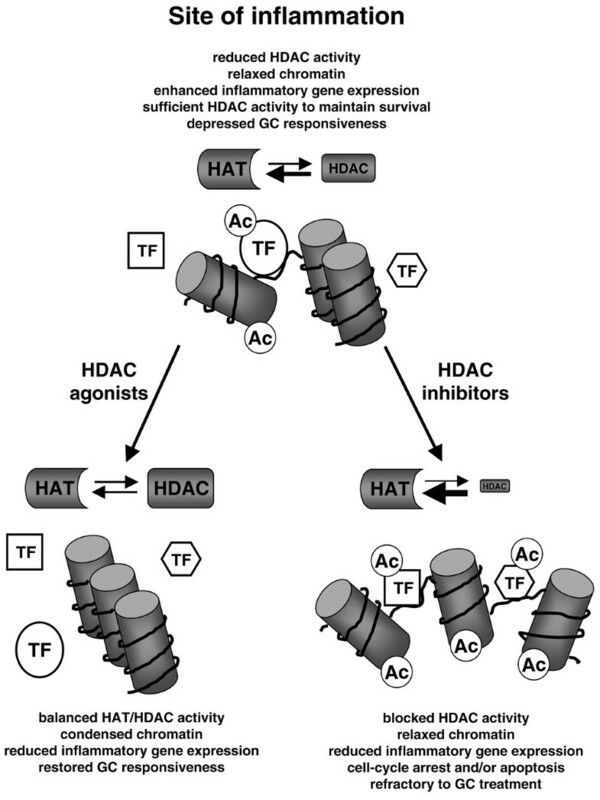 The therapeutic application of HDAC agonists may decrease inflammation by promoting chromatin condensation and/or deacetylating TF at sites required for DNA binding. Additionally, patients may respond better to GC therapy. Therapeutic application of HDAC inhibitors might demonstrate clinical benefits by preventing deacetylation of TF at sites required for their activation, or inducing transcription of genes promoting cell cycle arrest or apoptosis. HDAC inhibitors, however, might render RA patients refractory to concomitant GC therapy. Ac, acetylation. Restoration of HDAC activity could either decrease inflammatory gene transcription or enhance patient responses to GC treatment. If results from animal models of arthritis and in vitro studies of cells isolated from RA patients can be extended to RA synovial tissue, however, then residual HDAC activity may be critical for maintaining pathology. In this case, further depression of HDAC activity by HDACi might inhibit transcription factors required for inflammatory gene production, and instead may stimulate transcription of genes involved in cell cycle arrest and apoptosis. Several pressing issues need to be addressed as we proceed with the preclinical evaluation of HAT and HDAC modulators in RA. Of immediate importance is determining whether or not there is a relationship between changes in synovial tissue HAT activity and HDAC activity with inflammation in RA – and if so, whether this relates to changes in acetylation of histone or nonhistone proteins. We also need to examine the effects of HDAC modulators on the activation and survival of specific RA synovial cell populations. By extension, biochemical and cellular biomarkers most relevant to modification of HAT activity or HDAC activity in RA remain to be identified. The determination of which HDACs are important for activation and survival of these cell populations will shed light on the molecular mechanisms of drug activity, and will indicate whether pan-HDACi or the targeting of specific HDACs will be most useful in the clinical setting. Finally, in eventually moving new compounds to the clinic, no studies have been performed examining the relationship between HAT and HDAC activity and RA patient responses to GC therapy. Given the intimate interaction of GC and acetylation in inflammatory lung diseases, this may be important in the future design of clinical trials. Initial studies have certainly generated hope that modulating HDAC activity may provide a new therapeutic tool in the treatment of RA. But for the time being, until we more fully expose the contributions of protein acetylation and deacetylation to the pathobiology of RA, and the therapeutic potential of HDACi, it might be prudent to leave our HATs on. The authors would like to express thanks to Dr Martijn Nolte (Division of Experimental Immunology, Academic Medical Center, University of Amsterdam) for critical reading of this manuscript.